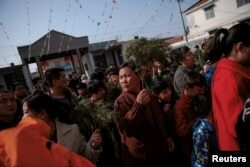 The Palm Sunday procession makes its way toward a government-sanctioned church in Youtong village, Hebei province, China, March 25, 2018. 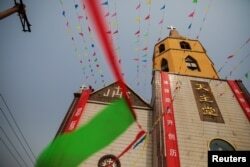 Choosing a church can be complicated in China under the rule of the officially atheist Communist Party — especially in Youtong village, where roughly half the 5,000 residents are Catholics. 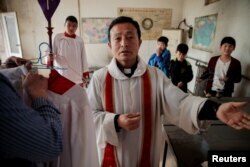 Within a mile radius, the village in northern China's Hebei province hosts a Catholic church sanctioned by Chinese authorities, two large "underground" churches, and numerous smaller unofficial house churches, according to villagers. A man decorates a government-sanctioned Catholic church a day before Easter in Youtong village, Hebei province, China, March 31, 2018. Bright red banners with religious slogans, including the Chinese characters for "Emmanuel," meaning God is with us, or "We have faith in you, Jesus" adorn the gates of many homes. Believers enter the government-sanctioned Catholic church during a mass on Palm Sunday in Youtong village, Hebei province, China, March 25, 2018. "The word 'compromise' sounds good but to some churchgoers it will sound like you are abandoning your faith," he said. "People say I am trying to break away, but in fact I am sticking to the old road, while the Vatican's policy changes." Dong Guanhua, an outspoken priest and the head of a local "underground" Catholic church, poses for a portrait in Youtong village, Hebei province, China, March 30, 2018. "Father Dong does not listen to anyone. He has made some people angry. But lots of people like his style, because he tells it like it is," said a man in his 40s who would only give his surname, Pei, a common name in Youtong. Father Ju Ruibin of the government-sanctioned Catholic church prepares for the procession on Palm Sunday in Youtong village, Hebei province, China, March 25, 2018. The real issue, he said, is that the Vatican and Beijing have contradictory and competing ideologies, a point he illustrates with a joke: "They say you can see what truly matters to a country by considering its architecture. In many European countries, the biggest buildings are the churches. In China, the biggest buildings are all banks and government offices, because that's where real faith lies."